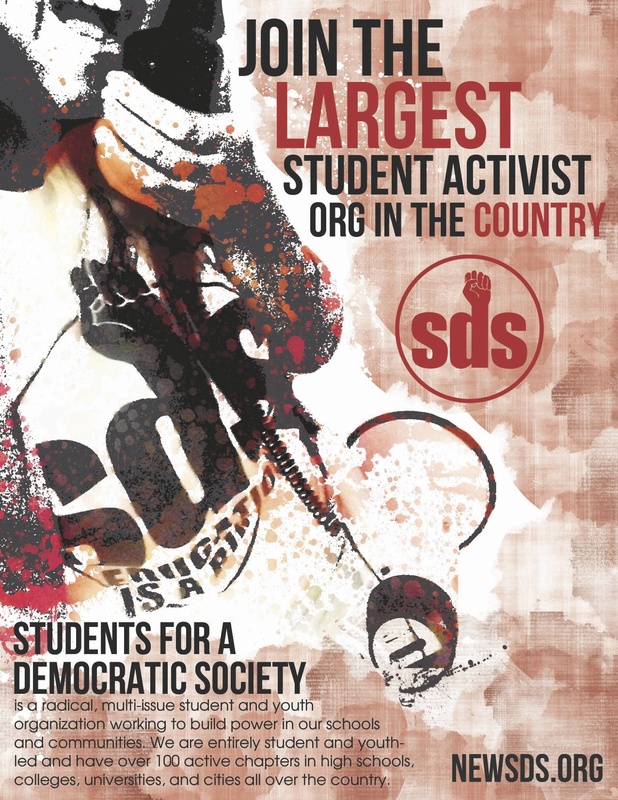 Students for a Democratic Society at the University of Minnesota recently launched the Campaign to Save Our School (Campaign SOS) in order to bring to the university’s attention the numerous contradictions between the mission of the UofM and the policies that are currently in place. Campaign SOS focuses on issues such as increasing the transparency of the university, creating equality and fairness in university policies, ensuring that the university becomes a socially responsible institution, and expanding the right to higher education. On Tuesday, September 29th university provost Tom Sullivan held a closed event inviting “student leaders” to participate in a conversation to discuss important issues. Despite not being invited to the event UofM SDS decided that this would be a perfect opportunity to bring the concerns of the SOS campaign to the administration and to demand answers. As SDSers entered the meeting room Tom Sullivan, Gerald Rinehart, and other administrators quickly fled to Sullivan’s office. When the administrators finally returned to the meeting Tom Sullivan prefaced the meeting by stating, “I want to respect the rights of the students that were invited and the time that they have to visit with us about it, and the other students that are here, if they have issues or concerns I’d be more than happy to receive them but I want to, at this time, give the students that were invited an opportunity. We can cover all the issues, but particularly the issues of the students that were invited.” SDS members were surprised and impressed that the provost was willing to listen to their concerns, but the provost quickly recanted his previous comment. After allowing several “student leaders” to discuss their issues with the provost, SDS members took the opportunity to voice their concerns. As one SDS member began to make a comment about disproportionate tuition increases for graduate students Vice Provost Gerald Rinehart abruptly cut the student off pressing that SDS was not invited to the event. Tom Sullivan agreed with Rinehart, and when called out on his change of mind Provost Sullivan lied, “I said we would accept questions or comments in written form from students who were not invited but in attendance. That’s what I said.” An SDS member presented the written list of demands for the SOS campaign, which the provost offered to receive after the meeting. Before he was then able to shift the conversation back to other issues SDS members were able to secure a meeting with Tom Sullivan and Gerald Rinehart. SDS members presented the list of demands to Provost Tom Sullivan following the meeting and received a verbal agreement, from both Sullivan and Rinehart, to schedule a meeting with SDS. This is a huge victory for the Campaign to Save Our School as it is the first time the administration has officially offered to hear the concerns of the campaign. This is an important step towards creating a more just university; join Campaign SOS to keep the pressure on the administration. To get involved in the campaign please email umnsds@gmail.com. If you would like to read the demands of Campaign SOS please visit umnsds.wordpress.com/demands. The Antiwar Working group of the Students for a Democratic Society (SDS) strongly condemns the September 4 Kunduz massacre perpetrated by the United States-led coalition in Afghanistan. Under the pretext of supposed “Taliban hijackers”, US warplanes bombed the northern Afghan village of Omar Kheil, killing at least 90 civilians and injuring many more. While horrifying, this is only the latest in a long series of war crimes and atrocities by the US in Afghanistan. On May 4, a similar strike in western Farah province resulted in 147 civilian deaths. “The US occupation is a disaster for Afghanistan, just like it is for Iraq. The Afghani people will never have stability and peace until the US leaves”, said UMN SDSer Stephanie Taylor. At the 2009 National Convention of the Students for a Democratic Society, a resolution to mark the 8th anniversary of the war in Afghanistan was passed unanimously. On October 7th, SDS chapters around the country will be organizing protests, actions and educational activities to raise awareness on campus about the continuing war in Afghanistan. Students for a Democratic Society is urging students and youth across the country to participate in whatever way they can. The SDS Anti-War Working Group exists to help coordinate national SDS anti-war activity. For more information, please contact Chapin Gray at 251.605.7780. More information, reports, and organizing materials are available on the SDS Antiwar Working Group’s homepage at http://sdsantiwar.wordpress.com. U.S. Out of Afghanistan Now! Fund Education, Not Occupation! Campaign SOS Visits Bruininks at Convocation! U of M SDS Launches Campaign with Banner Drops The University of Minnesota Students for a Democratic Society organized a direct action during Welcome Week to raise awareness of cuts to education that are plaguing universities across the country. Mpls, MN – Thursday Sept 3, 2009 members of the U of MN SDS chapter infiltrated ‘welcome week’ convocation to drop banners. Convocation at the University of Minnesota has historically been an event to welcome thousands of new students to the university and sing the praises of the University administration. ‘Welcome Week’ is increasingly closed off to any issue that runs counter to the administration’s message. The group was able to drop two banners saying “Bruinicks we can’t afford your mansion anymore. Cut administrative salaries! No more tuition hikes!” and “We pay Bruinicks $700,000+ per year to layoff thousands of workers”. The action interrupted the President’s speech and the building was locked down because of the disruption. Campaign S.O.S. is a campaign about economic justice, uniting students with the lowest paid workers on campus to put pressure on the University administration. The campaign seeks to demand things like more diverse student budget oversight, more scholarships to working class and low-income students, and cuts to administrative salaries rather than laying off staff. UMN SDS is confident that their S.O.S. call will be a force to be reckoned with on campus this year.